Examine life at the cellular level. Research new ways to cure disease. Survey marine organisms in their Puget Sound and Pacific Ocean habitats. Delve into the complex relationship between mathematical models and experimental results. Share your passion for science. Students in the WSDOT Wetlands Monitoring internship program identify plants in the lab. 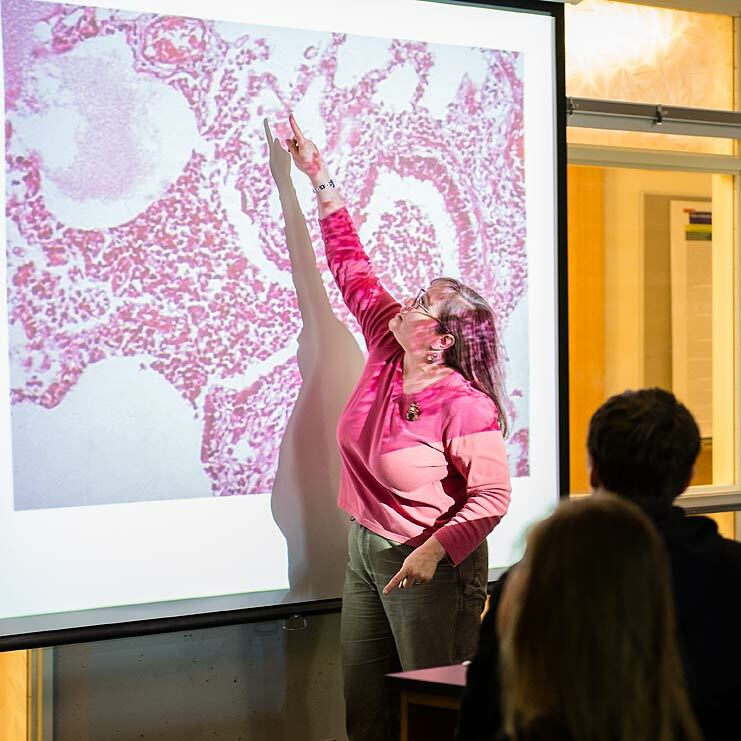 Biology and life sciences will prepare you for a career in medicine or the health professions, for a teaching career in secondary schools, or as a prerequisite for graduate study in science. As part of your liberal arts education, Evergreen’s mixture of interdisciplinary study and hands-on lab and field research will teach you how to apply scientific principles to solving real-world problems. Studying science at Evergreen is a different experience than what science majors get at most universities. Here biology, chemistry, physics, and other disciplines are woven together, providing a unique interdisciplinary education. From high-tech labs to field studies, you’ll develop an appreciation of the levels of organization of life, their diversity, and how physical, chemical, and geological processes have shaped life on earth. Numerous research students present their work at scientific meetings and have been authors on technical papers. At Evergreen, you’ll immediately begin learning to use sophisticated scientific equipment to answer complex biological questions. Many yearlong science programs begin with foundational work and quickly transition to student research projects so that all students gain scientific skills. You’ll also have opportunities to do scientific research as part of faculty research programs. Numerous students present their work at scientific meetings and have been authors on technical papers. David Ginocchio studies cross-sections of cottonwood leaves in the Scanning Electron Microscope. Ginocchio is working with Clarissa Dirks on Identification of a Novel Virus in Populus Freemontii. Students in the Molecule to Organism program complete their weekly laboratory work in organic chemistry and biology. This yearlong interdisciplinary program focuses on transformations of matter and energy in and between living and nonliving systems. You will end the program with a working knowledge of scientific, mathematical, and computational concepts, ability to reason critically and to solve problems, and with hands-on experience in natural science. You'll also gain a strong appreciation of the interconnectedness of biological and physical systems, and an ability to apply this knowledge to complex problems. Students in the summer Marine Biology program go sailing aboard the Resolute in Budd Inlet. Faculty Gerardo Chin-Leo had the students take plankton samples and salinity readings in the estuary. Students then drew illustrations of their findings. Sara Higgins ’08 pursued her dream to become a doctor. 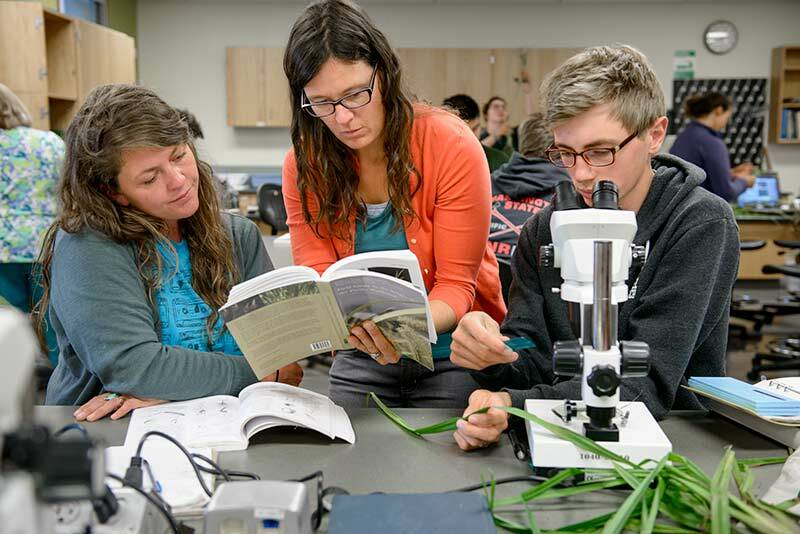 Evergreen biology graduates have an excellent record of success in graduate and professional schools, as well as working in a variety of scientific and technical fields. An Evergreen biology degree prepares you for jobs in laboratories, universities, or industry, and is excellent preparation for earning a graduate degree. It can be your springboard into professional school, where you’ll train to become a physician, dentist, veterinarian, or attorney. Or you can earn a teaching certificate so you can teach in high-demand science in K-12 schools. You’ll also be well prepared for a career in sales and marketing in science-related industries. The possibilities are limited only by your energy and ambition. The phage lab has been a center for undergraduate research at Evergreen since 1972, where involved students analyze these natural disease-fighting bacteriophages. Students of all levels have access to science labs with a full range of equipment and high-tech tools. Our students have unique opportunities to conduct scientific research using high-quality instruments, such as a scanning electron microscope and a nuclear magnetic resonance spectrometer. In addition, they use some of the best modern software available. The CAL supports the campus community with computing technologies for scientific inquiry. The phage lab has been a center for undergraduate research at Evergreen since 1972. Today, there are generally 10 to 15 students involved in work in the lab, analyzing these natural disease-fighting bacteriophages. Students have presented at various recent regional, national, and international meetings, including the biennial Evergreen International Phage Biology meetings. Students in the Evergreen upper-division science program Molecule to Organism undertook a study of the snails in Washington State. The work gave students with interests in molecular biology, plant biology, and ecology an opportunity to apply their interests in a team study. In this One Minute Evergreen, faculty Clarissa Dirks describes the project and its importance. Goggles, lab coats, and a whole lot more, including teaching technicians who will help you determine what you need for your experiments. EEON is a long-term research effort involving students and faculty conducting research in Evergreen’s 1,000-acre Puget Sound lowland second-growth rainforest. Their work is centered on 44 intensively studied long-term monitoring plots where they’re measuring biological diversity, development, carbon dynamics, and other characteristics. The largest event of its kind in Washington, the Science Carnival offers hundreds of presentations from Evergreen science students with an emphasis on demonstration, hands-on participation and fun, plus a volcano! More than 1,000 elementary, high school and college students and community members crowd Red Square and the science labs to learn and get excited about science. Topics include chemistry, computer science, biology, food science, health, physics, optics, geology, marine science, and a wide range of other disciplines. Andrew D. Brabban teaches molecular biology and biochemistry, focusing particularly on developing biotechnologies for agriculture, industry, and health care that improve the efficiency of a modern process or improve quality of life. His research includes the study of bacteriophages as model organisms in molecular genetics, as major players in microbial ecology, and as therapeutically important antimicrobials. He holds a Ph.D. in genetics and microbiology from the University of Liverpool, where he also earned a B.S. in microbial biotechnology. Clarissa Dirks aims to understand the evolutionary principles that underlie the emergence, spread, and containment of infectious disease by studying the coevolution of retroviruses and their primate hosts. Her teaching and research interests include biology, microbiology, virology, and the integration of art and science. She works with colleagues around the nation to examine and improve methods for teaching science, and received a major National Science Foundation grant to develop a science process and reasoning skills test.